Rwanda has made remarkable progress in the fight against malaria. All major malaria indicators have decreased significantly from 2005 to 2012. Rwanda’s health management information system reported an 86 percent reduction in malaria incidence, an 87 percent reduction in malaria morbidity, a 74 percent reduction in malaria mortality, and a 71 percent reduction in malaria test positivity rate. The national malaria control program has an ambitious vision of a Rwanda free from malaria and is aiming to achieve malaria pre-elimination status nationwide by 2018. 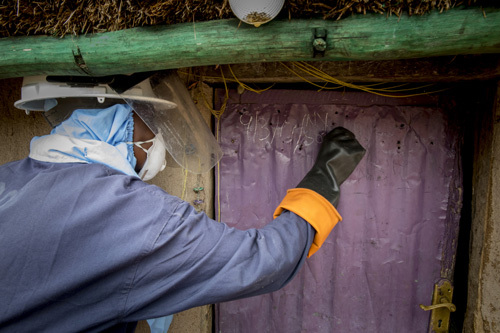 Through PMI support, Rwanda has conducted 17 spray rounds, nine of which have been implemented by the PMI Africa Indoor Residual Spraying (AIRS) project. The PMI VectorLink Project in Rwanda project will conduct IRS in the targeted districts according to an agreement between PMI and the MOH’s Malaria and Other Parasitic Diseases Division (MOPDD). The project also will support entomological monitoring and wall bioassay activities to assess insecticide decay rates and quality control for IRS. In the 2018 spray round, the VectorLink Rwanda project will work with the MOPDD and other stakeholders to achieve at least 85 percent spray coverage of the 206,611 targeted structures in the 26 sectors that make up the two districts of Kirehe and Nyagatare, using the OP pirimiphos-methyl CS; 813,177 residents will be protected. Support training, capacity building, and advocacy at the national, regional, and district levels as a means of facilitating IRS sustainability. The VectorLink project will work to increase the role of the district and the MOPDD in supervising IRS in 2018. This will include training on the use of a smart phone application for spray supervision. Provide regular M&E, including a daily Performance Monitoring Tracker (PMT). Use mobile data collection tools to collect IRS data for real-time feedback and decision-making. Carry out a logistics assessment in all districts and arrange all procurement, shipping, delivery, and storage of spray tanks, spare parts, insecticides, and personal protective equipment (PPE). Prepare and submit an informational letter report in accordance with the approved 2017 Supplemental Environmental Assessment. Ensure safe and correct insecticide application, thus minimizing human and environmental exposure to IRS insecticides. Coordinate information, education, and communication (IEC) and behavior change communication (BCC) sensitization and mobilization activities with other stakeholders. Provide technical assistance during spray rounds conducted by the MOPDD.